Deck the halls with boughs of holly… fa la la la la… Have you decked your doors yet? While an evergreen wreath is most traditional, there are wreaths in all shapes, sizes and materials. From old-school pinecones and fruits to colorful Christmas baubles that can be re-used year-to-year, here is a round-up of some pretty creative wreaths to shake things up this Christmas. 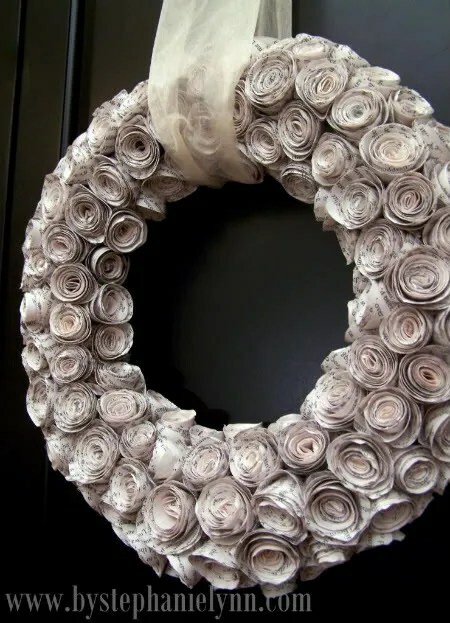 One of the most beautiful wreaths I’ve seen in a long time is this curled paper wreath made from old book pages. This is a great way to recycle the paper from an old book that might be destined for a landfill. 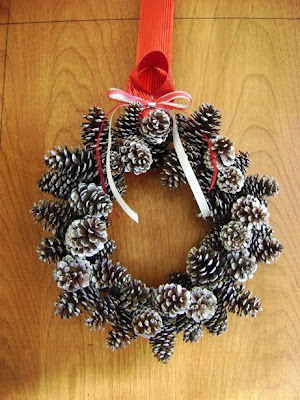 This is an incredibly beautiful and dainty looking wreath that can be reused year to year. Lifestyle guru Eddie Ross shows us how to make an easy ornament wreath with dollar store ornaments and a wire clothes hanger. The trick is all in the hot glue! This is an easy DIY project that can be fully customized to the color of your décor and it would make a wonderful gift. Easily stored and re-used from year to year. These pretty fruit adorned square wreaths are made with a square grapevine base for a something a little different. Wrap a pretty ribbon and add either faux or fresh fruit (apples work great out in the cold weather) for a colorful and very naturalistic wreath. Those with faux fruit can be reused year to year. If using fresh, simply remove the fruit, clean up any bits left over and store for another year. How cute is this nautical wreath spray made from an old chippy red painted bouy festooned with greens, berries and ribbon? During the year, keep your eyes peeled for these vintage treasures and come the holidays, you’ll have a unique decoration that will look like it cost a million. A rummage through your drawers or a trip to the dollar store will easily net you a whole raft of small inexpensive gift boxes for this cute wreath. Simply wrap the boxes in your favorite papers (use oilcloth or plastic wrap for outdoor use) and ribbons and attach with hot glue to a basic wooden form. 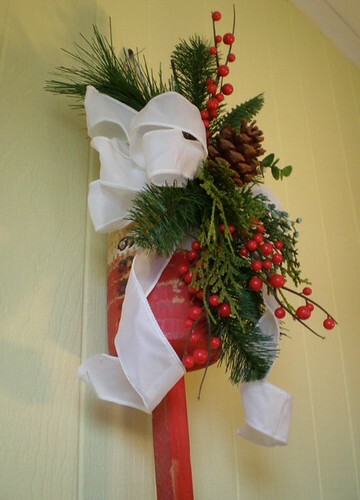 Add a wide ribbon to hang. Show off this year’s Christmas cards, or collect your favorites from year to year for a memory wreath that will bring a smile to your lips and possible a tear to your eye. If you live in certain areas, there is nothing more plentiful than natural pinecones. Collect them all fall and cover a wooden or grapevine wreath with these natural wonders. And the scent of natural pine is always a winner! You can also purchase pinecones in craft stores, but stay away from artificially scented products, which can severely irritate allergies. Thanks for the post! I'll bookmark this for future reference! Hi Linda, These are beautiful examples of unique and special Christmas decorations. What I like about them most (besides being different) is that the decorations are made of almost all natural materials. Thank you for including us, honey! Happy Holidays!